Nevada was the first state to have regulated online poker in the United States, but that doesn’t mean that offshore online poker in Nevada is dead, quite to the contrary actually. Regulated poker can have some perks to players, but there are still a significant number of drawbacks that might cause players to not feel the best value for them is through these sites. Small fields, limited game selection, stripped down bonus systems and many other aspects of these sites might cause players to search for something better for Nevada online poker..
Offshore sites provide this to players in Nevada. While there are fewer choices available to players than in some other non-regulated states, there is still a lot to choose from, especially if you are looking for soft games and high rewards. Below we discuss some of the best places for players within the state of Nevada to play from with very little worry of repercussions! What Online Poker Sites Can I Play in Nevada? There are a couple of fully regulated and licensed online poker rooms for Nevadans, but you may be dismayed by their overall size, so we've compiled a catalog of the top offshore sites for Nevada residents. All of them are reliable, and they process cashouts fairly and rapidly. Read through our reviews below, and it's very likely that you'll be able to select a good location for playing cards online. Sportsbetting.ag is part of the Chico Poker Network, the largest virtual poker room open to residents of the Battle Born State, so you should have no trouble finding a seat and table you like in the game of your choice. When you make your first deposit, you'll receive a 100% up to $2,500 bonus, which pays out at a rate equal to 33% of your rake and tourney fees. Ring games are spread from $0.01/$0.02 through $5/$10 in No Limit Texas Hold'em and Pot Limit Omaha, and there are also some tables of PLO/8 as well. At blind levels of $0.50/$1.00 and above in NLHE, some tables are marked as “Bad Beat Jackpot” games, giving you the chance to take home a massive prize if you participate in a qualifying hand. The jackpot pool has paid out as much as $650K in the past. Sit n' gos are always starting up at SB.ag at stakes from $0.05 to $500 + $25, and there's a surprising amount of action up through about $100 or $200. On the multi-table tournament front, things are a bit weaker because most of the contests are for $33 and below with correspondingly small guarantees. The exception is the $90 + $9 Main Event, which awards at least $50,000 every Sunday, and on the last Sunday of the month, it grows to a $100 + $9 buyin and $100,000 guaranteed. You can play at Sportsbetting.ag from a PC or Mac with the download poker software, and there's also an app for iOS and Android. The mobile poker experience here is very good, and almost the entire range of games available to desktop users is also accessible from smartphones and tablets. There are other gambling products for you to try out too, like a casino, sportsbook, and racebook. As you put in the time at the tables, you may find yourself climbing up the leaderboards. There are three of them, one for cash, another for SNGs, and a third for MTTs, and they're worth a total of $20,000 every week. In addition, you'll receive a value of about 5% cashback through comp points, which can be used in place of your real money funds to enter select tournaments. Click on the banner link above to go directly to Sportsbetting.ag and register your account. If you want to delve deeper into the particulars of this poker room first, then look through our report on the games and promos at Sportsbetting.ag. You may also wish to read our review of BetOnline, which is also on the Chico Network. As a trusted name in betting for more than 30 years, Intertops is one of the most reputable destinations you could choose for all your real money gaming activities. It's the flagship of the Horizon Poker Network, an entity that's known for the generosity of its promotional offerings. When you sign up for an account, you'll get a 200% up to $1,000 bonus and 100 free casino lines. You'll see plenty of games up to about the $50nl level, but higher-stakes action is sparse. The same is true in sit n' gos where what little traffic there is tends to cluster at small buyins of $5 and below. MTTs are a bit better because there's a $50 + $5 tournament called the Sundowner that takes place every day and comes with a guarantee of $1,500 ($2,500 on Sunday). In addition to a fairly well-rounded poker room, there are three casinos (one of them inside the poker client) and a sportsbook. You can therefore do all your gambling in one place at Intertops. Bonuses and other rewards for these separate betting offerings abound, giving you the opportunity to help yourself to some of the house's money. Your 200% poker bonus is worth approximately 27% rakeback, and you'll also get 36% dealt rakeback on all your play. The 100 free bets in the casino have an expected value in excess of $90 as long as you deploy them on a game with a low house edge. Other ways to get crazy value at Intertops Poker include a $4,000 weekly rake race, frequent tourney overlays, reload bonuses, and the loyalty tiers program. If you're ready to take the plunge and play at Intertops now, follow our banner above. To learn more about the site first, consult our comprehensive review of the Intertops poker platform. Despite the fact that the Grand Poker Network only opened its doors in 2014, you can count on its dependability because it's managed by the large 5Dimes bookmaking organization. The only real stumbling block here is player liquidity, so if you have your heart set on multitabling, then it's probably best to designate 5Dimes as your backup site and choose a different room as your main poker home on the internet. Cash games run from $0.05/$0.10 to $1/$2, and some of the adversaries you encounter will play a bit worse than their counterparts at similar stakes on other sites. Most of them are mainly casino bettors and sports wagerers who are joining poker tables just for fun and laughs. Needless to say, this is good for your bottom line. What's also great for your profitability are the fee-free tournaments here, a few of which run every day. Now, there are no MTTs above $5.50, whether they charge fees or not, so this is an advantage only for microstakes tourney fans. But whether you enjoy small stakes or large, you'll certainly appreciate the 50% rakeback that every one of our players receives. A $500 freeroll beckons every Sunday. Become a member of 5Dimes by clicking on the "Visit Site Now" button above. To find out more about this site and others on the same network, check out our Grand Poker Network overview page. Nitrogen Sports is considered by many to be the premier Bitcoin sportsbook on the internet. The company has expanded its reach by inaugurating a poker room to allow its users to play cards too. All transactions are conducted in BTC, including play at the tables, with one chip being equal to 1/1,000 of a bitcoin. Most of the games are solidly in microstakes territory, but you might be able to table start at higher blind levels and entice a couple of opponents to join you. There are many overlay tournaments as well as freerolls that give you an opportunity to pick up some extra value. The Nitro rewards scheme allows you to collect free mBTC credits and complimentary bets to use in the sportsbook. The more you play during a month, the more Nitro credits you'll receive, so keep grinding to maximize your returns. When it's time to withdraw your winnings, you'll fnid the cashier speeds at Nitrogen to be among the best in the business. Follow the "Play Now" banner above to go to the Nitrogen site and open up a new account. We've compiled a lot of additional info in our page describing the ins and outs of Nitrogen Poker in case you wish to learn more. As a descendant of Seals with Clubs, the original Bitcoin-only poker room, SwCPoker continues the tradition of dox-free, bankster-free internet poker entertainment. Your coins will be converted into SwC chips at a rate of 1 BTC = 1,000 chips, and you won't have to worry about exchange rates, conversion fees, and the other hassles involved in playing at a fiat currency site. SwCPoker hosts tons of different variants, including the expected NL Hold'em and PL Omaha but also 2-7 Triple Draw, Razz, 7C Stud, HORSE, and OFC. The stakes run from 0.01/0.02 up to games with blinds of hundreds of chips. The number of players logged in at any one time is a bit underwhelming, But this gives you a chance to boost your results with the 50% rakeback that you'll earn on all your two- and three-handed play. Additionally, there's a Krill rakeback program that will grant you up to 50% RB based upon the amount you play over the lifetime of your account. Sign up now by following our banner link above. Or you can peruse our detail-rich SwCPoker review to familiarize yourself with the reasons for playing here. Nevadans are used to having many options for land-based gaming, and this is true on the internet as well. It might seem challenging to choose the best among them, but we're here to help you out in this matter. While we can't make the final decision for you, we can provide you with a list of factors to take into account when making your decision. Consider our advice in conjunction with your personal preferences to identify the best site for you. ‡ If the amount of action at a particular room is your foremost concern, then the Chico Network has the populated tables you seek. ‡ If you'd like to be able to play from your phone or tablet, then the mobile solutions at Chico, Grand, and Nitrogen will allow you to fulfill your wish. ‡ If you're a dedicatd Bitcoin user and don't like using fiat currencies, then Nitrogen and SwCPoker are your options for BTC-only gameplay. ‡ If you think that rakeback is the best type of reward, then Horizon and Grand are ready to offer you 36% and 50% respectively. ‡ If large bonuses are your delight, then you may wish to think about Chico and its $2,500 deal. ‡ If you want the chance to play ususual formats of poker, then SwC has dozens of types of games for you to revel in. ‡ If you like to dabble in sports-betting and casino games, then Chico, Intertops, and Grand have enough forms of real money gaming to satisfy you. There are several methods you can use to fund your poker account, and similarly, you can receive your withdrawals via a number of different means also. Credit cards, money transfer services, and old-fashioned checks all have a role to play. It might be best to transact using the cryptocurrency Bitcoin. It enables you to move money around quickly and with very low ffees. If you're unsure of how to properly utilize digital coins, then you can browse through our tutorial on the subject. Nevada is renowned as a gambling hotspot throughout the world, but this doesn't mean that it's a complete free-for-all. Many wagering activities are allowed, but they're strictly supervised and regulated. Most of the legal codes in NV that deal with real money gaming apply to the operators of the games, but there are a few that govern what individuals can and cannot do. The majority of the gambling law in the Silver State is contained in NRS 463 - Licensing and Control of Gambling. However, there are a few additional provisions listed in NRS 465 - Crimes and Liabilities Concerning Gambling. Placing, sending, transmitting or relaying wagers to another person prohibited under certain circumstances; penalty. (b) From outside of this state, place, send, transmit or relay through a medium of communication a wager to another person or an establishment that is located within this state. This language was only added to the law books in 1997 and is clearly aimed at preserving existing casino operators' revenues from outside competition. The “except as otherwise provided” clause refers to another area of the law which exempts bets made through properly licensed providers within the state or entities outside the state that have made an agreement with the Nevada governing bodies. Violation of this statute is a misdemeanor, which carries a fine in Nevada of up to $1,000 and/or imprisonment for a term of six months or less. However, we've been unable to turn up any cases in which 465.093 was used to go after any normal internet poker player. This law seems to be designed to dissuade people from acting as agents or employees of offshore gambling organizations. You, as a private citizen, have nothing to fear from the law when you open up a few online poker tables and start playing. It's different on the other side of the fence for those who actually operate online poker rooms that serve Nevadans. The legal regime that they must follow goes on for pages, and the definitions sections alone encompass more than 70 terms. Sites that wish to comply with the regulations must apply for licenses from the Nevada Gaming Control Board, pay taxes and fees, use geolocation to prevent anyone outside the state from playing, keep all player funds segregated from their everyday business finances, and more. A failure to adhere to the rules can result in felony convictions, fines of up to $50,000 plus restitution, and jail terms as long as 10 years. Whether because of these strict punishments or because of the complexities of navigating NV law, several foreign internet gambling companies have elected to leave the Silver State alone. Nevertheless, there are plenty of places to play online, apart from the paltry selection of fully regulated sites, and nobody has ever gotten into any legal predicaments for doing so. 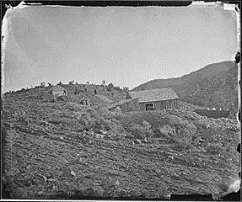 From the time of Nevada's incorporation into the Spanish Empire in the 18th century through to its achieving statehood in 1864, including periods under Mexican rule and as a territory of the United States, the area was a thinly populated wasteland. After all, most of the state is mountain and desert. In 1860, there were only 7,000 residents. This didn't stop the first Territorial Legislature from passing An Act to Prohibit Gambling in 1861. By that time, the Comstock Lode had been discovered and mining camps sprung up by the dozen. The restrictions against gambling didn't sit well with independent, risk-seeking miners, and the prohibitions were weakened and altered so that most of the penalties fell on the managers of the games rather than mere players. Throughout the next few decades, the Nevadan economy went through booms and busts as ore production stalled but then became reinvigorated by the discovery of new deposits underground. Throughout the late 19th and early 20th centuries, moral progressives were gaining strength throughout Nevada and indeed the rest of the United States. In 1909, they were successful in having games of chance banned across the state although certain aspects of this law were later altered to allow for social card games. By the end of the 1920s, Nevada was in dire straits as the mining scene was deteriorating, and it was suffering from the Great Depression along with the rest of the country. On March 31, 1931, a much-needed source of revenue opened up from the signing of Assembly Bill 98 by Governor Fred Balzar, which allowed commercial casinos to operate legally. Nevada thus became the first state in the union to permit large-scale, real money casino gaming. 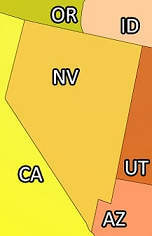 At first, the action was concentrated in Reno, but Las Vegas began to overtake its more northern rival. 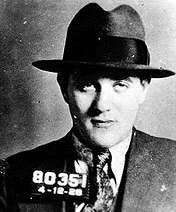 Sin City was given a helping hand in this respect by mobster Benjamin “Bugsy” Siegel. After being tarnished by a murder trial from 1939 - 1942 (he was acquitted after two of the state's witnesses mysteriously died), he moved to LV to start anew. His Flamingo Casino experienced cost overruns, delays, and even a multi-month closure to complete unfinished construction. After a few years, it became a huge success, providing an upscale environment altogether distinct from the grubby arenas hitherto popular and inaugurating “The Strip” as the place to go for a good time in Vegas. However, this came too late to help Siegel. Mafia kingpins who had invested in his enterprise were getting frustrated with his failure to turn a profit. Bugsy was gunned down in his Beverly Hills mansion in 1947. During the '50s and '60s, the city continued to grow both in terms of population and the number of gambling establishments that were built. In 1970, innovative casino exec Benny Binion had the idea of inviting seven of the top poker players in the world to play against each other at his Horseshoe casino in downtown Las Vegas. Johnny Moss was voted the best player by the others and thus crowned the first champion of the World Series of Poker. Clearly, the initial format of the WSOP was different from how it is today, but the freezeout tournament structure was adopted the following year, and the $10,000 pricing of the Main Event followed in 1972, so the winning ingredients all came together pretty early on. Today, the World Series is held at the Rio All-Suite Hotel and Casino rather than the Horseshoe, and the fields number thousands rather than just a handful. It's still the most prestigious series in the poker world although it faces heavy competition from other events not just in Nevada but all over the world. In 2013, Assembly Bill 114 was approved, creating a legalized framework for online poker. Ultimate Poker became the first company to offer its services under the new system in April 2013 – and the first fully licensed internet poker site in the entire country – although it ceased operations just a year later. In 2014, the governor of Nevada signed a compact with the governor of Delaware to share online player traffic. Both states are small, and so the total number of people affected by this deal is tiny, but it could pave the way for more sizeable states to join in the future and grow a bustling USA regulated online poker scene. Well, this is a rather easy section to write, because regulation has already happened in Nevada. Nevada was the first state to legalize and regulate online poker in the US in 2013 and has since combined forces with Delaware to also be the first state to partner with another state to offer services to a united player pool. New Jersey also joined this traffic sharing compact in May 2018. While Delaware was a barely functioning regulated state on its own, because of the population size, Nevada has had greater success with its efforts. It’s important to note that gambling organizations either needed to not operate in the US post-UIEGA or be a new company in order to offer services to the state. This has caused WSOP.com to become the largest operator in the state while not being the largest global brand. It is not clear when or if The Stars Group will be entering the Nevada playing space and until that does happen, WSOP.com should continue to reign supreme in the walled garden that is the Nevada regulated online poker space. Read our WSOP.com review for further info on this internet cardroom. Nevada has several major types of gambling, but strangely doesn’t have one thing that many assume they would. Nevada is not home to a state lottery which might surprise a lot of people, because the state embraces gambling of pretty much every kind. Even more odd is there really isn’t any desire to introduce a lottery into the mix of the state’s offerings, so don’t expect to see it any time soon. Luckily for citizens, there are more entertaining ways to gamble as Nevada is home to land based casinos, tribal casinos, and charitable gaming opportunities. There's pari-mutuel wagering too, but it occurs on races from outside the state because there are no permanent racing facilities inside Nevada's borders. Of course the most famous and notable of all of these are the land based casinos that have given rise to the city of Las Vegas and the opulence that it has encouraged. While almost everyone knows about Las Vegas, there are other great casinos in the state that normally get overlooked because they are not as fancy or well-known. Reno is one of the best places to go for outdoor enjoyment in the state while also being home to some great casinos. Many other northern cities also mix nature and casinos well to give a much different feel than what you could find in Las Vegas. Tribal casinos are also an often-ignored offering of Nevada that have a different kind of vibe as the tribes normally work under different laws than the commercial casinos. That said, Las Vegas is certainly the center of poker in the state. The Bellagio has 40 tables containing NL Hold'em, LHE, PLO, Seven Card Stud, and mixed games, and there are tournaments every day. 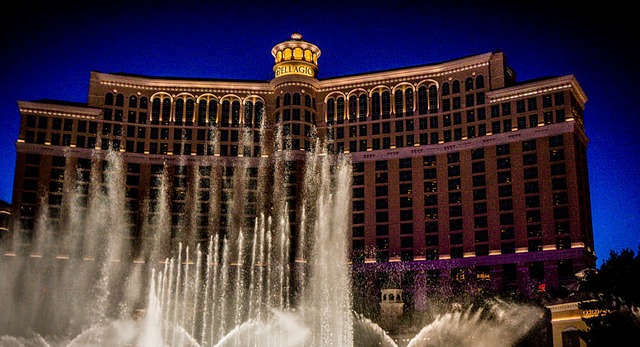 High rollers at the Bellagio get to enter Bobby's Room: a two-table enclosure that has hosted some of the biggest games in town, including the stratospheric contests between banker Andy Beal and a “corporation” composed of the likes of Jen Harman, Barry Greenstein, and Phil Ivey. Other top cardrooms in LV include the Aria and the Wynn, but there are dozens of well-managed venues for brick-and-mortar poker. If Nevada online poker regulated sites are too tame for your tastes, then you can join one of the offshore firms that operate in the state. You won't have any legal issues doing so as a player; Nevada law concentrates on those who offer the games rather than those who participate in them. Choose a worthy site from our recommended list, and start playing online poker in Nevada today! If you are lucky enough to have another address in a nearby state, be it your business address, summer home, second apartment, family home, etc, you may have other online poker options available to you. Here are a list of the states that border Nevada and Professional Rakeback's review on each of them: Arizona, California, Idaho, Oregon, Utah, Washington, or Wyoming. If your secondary home lies in another state, or if you just want a broad overview of the situation in the United States as a whole, then our U.S. players' online poker guide may prove informative. The topic of online poker in the State of Nevada is one that many people are ignorant of. Please think about sharing this page with any of your friends and family who want to learn more. By doing this, you'll be spreading knowledge about the wonderful game of poker as conducted over the internet. The online poker scene in Nevada is complex, so it's understandable if you still have a few questions about it. Look below for the answers to some of the most prevalent questions about this topic. Is Global Poker a legal online poker entity in Nevada? Global Poker feels that it's operating in full compliance with the law in Nevada and throughout the United States. We aren't of the same opinion. A thorough discussion of this subject is beyond the scope of this FAQ, but you can turn to our review of the Global Poker room for additional insight on this matter.